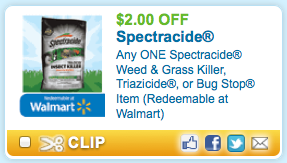 Print a coupon for $2.00/1 Spectracide Weed & Grass Killer, Triazicide or Bug Stop Item. Use the zip code 84123 to print it. With the coupon and the rebate form on Spectracide’s Facebook page, you can get Bug Stop and other Spectracide products for FREE! Final price: 4 products for FREE! I’m Shar, a new follower from the Naptime Review Bloghop!